Happy National Agriculture Day! To celebrate, we found an article by Virginia Cooperative Extension Agent Scott Reiter in Prince George County with current statistics that you may or may not have known about American and Virginia agriculture. American Agriculture: Generations Nourishing Generations is the theme for National Agriculture Week March 17-23, 2013. This is also the celebration of the 40th National Agriculture Day on March 19. Agriculture provides almost everything we eat, use, and wear on a daily basis. But too few people truly understand this contribution. 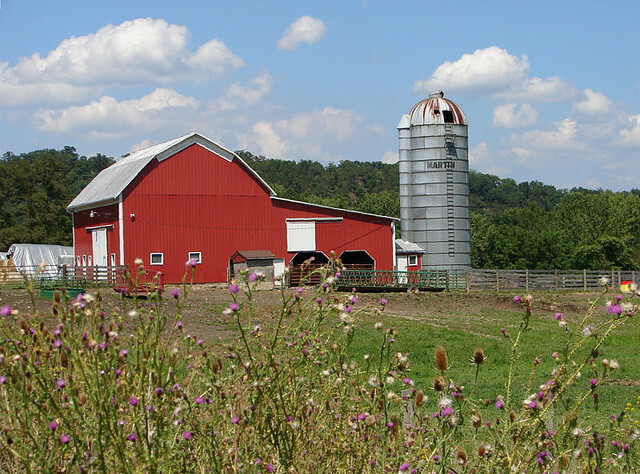 More than three million people farm or ranch in the United States. Individuals, family partnerships or family corporations operate almost 99 percent of U.S. farms. Over 22 million people are employed in farm or farm-related jobs, including production agriculture, farm inputs, processing and marketing and wholesale and retail sales. Virginia has over 47,000 farms and provides 357,000 of those jobs. Agriculture and forestry has a $79 billion impact in Virginia making it the states largest industry. Forty-one percent of U.S. total land area is farmland (938.28 million acres). Virginia has 8.1 million acres of farmland which is 32% of the states land area. We have lost 500,000 acres of farmland in Virginia to development of housing, roads, and other industry since 2002. The top five Virginia agricultural commodities are poultry and eggs, cattle and calves, dairy products, corn, wheat, and soybeans, and nursery-greenhouse production. U.S. farmers produce 46% of the world’s soybeans, 41% of the world’s corn, 20.5% of the world’s cotton and 13% of the world’s wheat. In the Petersburg area, crop production of corn, soybeans, wheat, cotton, tobacco, and peanuts are the leading source of income. Cattle and calves, nursery & greenhouse, and dairy follow in value. There are also numerous small farms selling vegetables directly to consumers. Many local vegetable farms can be found in the “Buy Fresh, Buy Local” guides(www.buylocalvirginia.org) or the Virginia Grown Guide (www.virginiagrown.com. Virginia ranks high nationally in the production of many crops. Leaf tobacco, 3rd in the nation; fresh market tomatoes, 4th; turkeys and wine, 5th; apples, summer potatoes, and fresh market snap beans, 6th; grapes, 8th; peanuts and sweet potatoes, 9th; and fresh market cucumbers, 10th. As you can see, Agriculture is abundant in variety and amounts of products produced. Farmers and ranchers are independent business people who provide for their families by growing and producing food and fiber. They use modern production techniques to increase the quality and quantity of the food they produce. In the 1960s, one farmer supplied food for 25.8 persons in the U.S. and abroad. Today, one farmer supplies food for 144 people in the U.S. and abroad. Quite simply, American agriculture is doing more – and doing it better. – The efficiency of U.S. farmers benefits the United States consumer in the pocketbook. Americans spend less on food than any other developed nation in the world. American consumers spend the lowest percentage of their annual income on food – just 10 percent. – A farmer receives about 19¢ for the wheat in a 1 pound loaf of bread, they get about 10¢ for the corn in an 18 ounce box of corn flakes, and a dairy farmer receives about $1.72 for his fluid milk in 1 gallon of milk at current market prices. The rest of the retail price is processing, packaging, transportation, and profit margins. – Agriculture generates 20% of the U.S. Gross Domestic Product. – One-fourth of the world’s beef and nearly one-fifth of the world’s grain, milk and eggs are produced in the U.S.
– The United States exports $43.5 billion in agriculture products and imports $26.4 billion in farm products, equaling a positive net trade balance of $17.1 billion. – Cotton is by the far the most dominant fiber produced in the United States and is used for apparel, home fabrics as well as industrial uses. – Farmers use reduced tillage practices on more than 72 million acres to prevent erosion. – Farmers maintain over 1.3 million acres of grass waterways, allowing water to flow naturally from crops without eroding soil. – Agricultural land provides habitat for 75 percent of the nation’s wildlife. – Forests cover 16 million acres in Virginia and the forestry industry generates over $25 billion in timber, manufacturing, and supporting industries. Now you might ask, “What does Generations Nourishing Generations mean?” As mentioned earlier most farms are family businesses. It is not uncommon to see 2 or 3 generations in a family farm working together. And consider that some farms have been in existence since the founding of Jamestown. This means you may have the same land farmed by the same family for 10 or more generations!! Not many businesses have that kind of history. In Prince George, we have one of the oldest continuously operated farms in the United States. Brandon Plantation has been farmed since 1614 although not by the same family. Since 1619, Brandon has been operated by four families. The Harrison’s farmed from 1720-1926 at which time the Daniel family bought the farm and continue operations today. So you can see that many generations of farmers have feed the many generations of families in the United States. The next time you go to the grocery store, pass a farm field, or sit down to eat think about where your food comes from. And if you get a chance, thank the people that grow and deliver nutritious food to your family every day.